Hypolimnas bolina jacintha (Jacintha Eggfly), the dancing queen! It’s never too much to enjoy whatever nature has to offer, especially the fascinating butterflies, dragonflies and bugs that share our garden space. Precious moments of delightful joy is ours to seek and savour, and then be thankful to our Heavenly Father for such blessings of pleasurable encounters with nature. This happened on November 5th around 4.45 pm. My beloved hubby called out joyfully to me, from the garden, “Darling, come..quick! 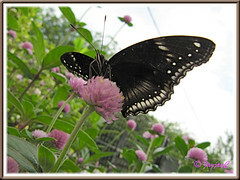 The large black butterfly that came a few days ago is here again!” Though engrossed online, I quickly hastened outside with my new Canon Powershot SX 200IS camera in hand. Is it the butterfly with the tattered dress, I wondered? Apparently so! But as I drew nearer, I could see that it was no longer ragged but adorned in the most beautiful attire! Simply magical, like Cinderella’s rags, changed to a beautiful gown! 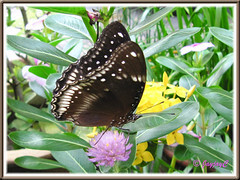 Hehe, same species but definitely not the same butterfly that visited us, October end. Incidentally, this gorgeous butterfly is a female Hypolimnas bolina jacintha, also commonly known as Jacintha Eggfly. No wonder, it was like a dancing queen, gliding ever so gracefully and elegantly on the Bachelor’s Buttons soft ‘helipad’. What a tease she was and so vain, but was I thrilled! She posed for 38 macro captures in 20 minutes, leaving intermittently and coming back for more. I was pleasantly surprised that she allowed me to get so close, almost touching her! Unbelievable, yet so true and so exciting! She seemed fascinated with the pink Gomphrena globosa that are currently flowering profusely, though she did perched briefly on the Catharanthus roseus, scented flowers of Brunfelsia calycina, Duranta erecta and the Mophead Hydrangeas nearby. These are some of the flowering plants that are truly butterfly attractants. 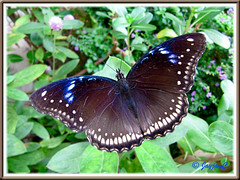 It is a fairly large-sized butterfly with wingspan between 9-11 cm wide. The base of its uppersides is brownish black, forewings darker than the hindwings. The latter are beautifully trimmed with distinct submarginal white markings that extend to the forewings as well, in lovely contrast. However, it’s the striking splashes of iridescent blue spots on the forewings that really sealed its gorgeousness, shimmering from bluish to purplish hues, depending on the light and its angle of pose. 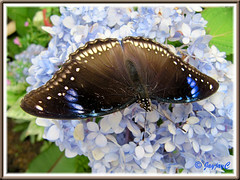 The male, on the other hand, has very similar features like the Hypolimnas bolina bolina (Great Eggfly) on the uppersides, with 4 distinct blue-edged white patches on both the forewings and hindwings. The undersides are as attractive too, beautifully patterned with white markings against a blackish brown background. Like the Great Eggfly, Jacintha Eggfly is also a subspecies of Hypolimnas bolina and highly territorial and inevitably, both share similarities in features and host plants. The most distinguishing feature between these 2 subspecies is than the latter has wider and thicker submarginal bands on its hindwings, whereas those of the Great Eggfly are usually smaller, distinctly V-shaped and separate. Distribution range: Madagascar, Socotra, Mauritius, India to Myanmar, Andamans, Thailand, Laos, Vietnam, Peninsula Malaysia, Singapore, Sumatra. Habitat: Fairly open forest, secondary growth and gardens. 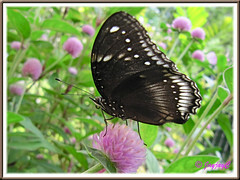 Butterfly Circle on H. bolina jacintha. View its impressive butterflies checklist photo gallery to help ID your butterfly or just sit back and enjoy its online ‘buterfly park’. We’re extremely glad to have discovered this fascinating butterfly’s ID! Always great to know our visitors by name. 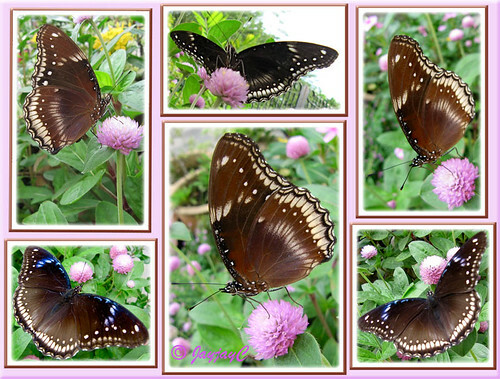 Here are a few more photos of the perfect garden model, Hypolimnas bolina jacintha! What a lovely name for our dancing queen! My! What beautiful pictures and all the info about the butterflies! Thanks for sharing! 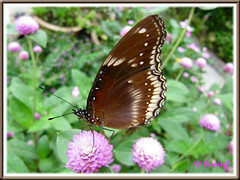 Im now been very much fascinated about butterflies when I see them in your blog. Thanks for sharing, those pictures are truly very descriptive and very clear – I guess I wouldn’t even able to note all the details as they fly too fast in my garden. Janie and James – you’re both most welcome, really our pleasure in sharing. Thank you both so much for visiting and leaving your kind thoughts, most appreciated. Have a lovely weekend! You have done a superb job in capturing this butterfly. Although the colour is quite dull, but it looks so beautiful. I am sure it has got to do with your camera skills. 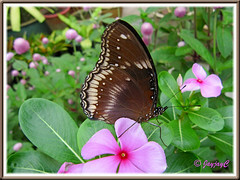 I used to visit J&J for flower classifications but now you have added another expertise, the butterflies! Wow. Have a great weekend, Jacqueline. Cheers and have a great rest of the week, my friend! Thanks, Loopy Mom! I’m as excited…will hop over shortly to see. At the end of our project I’m listing the sites I found helpful; I hope you don’t mind if we include yours as part of suggested reading. Your gorgeous photography just made us even more eager to see the emergence of our own little dancing queens! You have a wonderful site–thank you for sharing! You’re most kind with your words, Loopy Mom, and thank you! We’re most honoured by your request…by all means, go ahead to link us, and thanks again. Jacqueline, the first of my daughter’s butterflies emerged today, it was amazing! The second one might come out tomorrow morning. Hi Loopy Mom! Thanks so much for signaling its arrival…what a gorgeous beauty indeed! The blues are absolutely intense and so strikingly beautiful! Congrats on a job well-done! 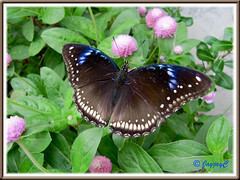 Is it possible that it’s not Jacintha Eggfly, but the Great Eggfly or Blue Moon Butterfly instead. 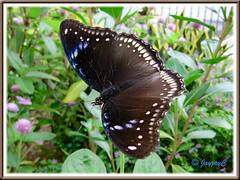 Have a look at my article here https://www.jaycjayc.com/the-great-eggfly-hypolimnas-bolina/ for comparison. I’m not an expert on ID, just using images from online to ID my garden visitors. Do correct me if I’m wrong though.